Francesco Vitale at Nauta Yachts calls with the welcome news that his central listing, the 24m sailing yacht Virtuelle is now sold, with Olivier Beaumelou of VPLP introducing the buyer. 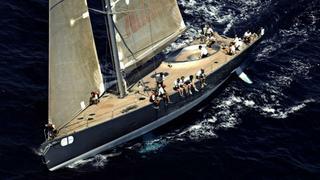 Virtuelle was built by Tencara in 1999 for an experienced yachtsman. With naval architecture by Andrea Vallicelli, her contemporary Philippe Starck interior accommodates six guests in a master and two twin cabins. During her career Virtuelle collected awards at many international regattas, including a first place in the 2001 Maxi Rolex World Championship. In 2004 she was sold to her previous owner and used only for cruising, maintained in immaculate condition.